Keep lips soft, glossy and young. This luscious, lip-softening gloss contains broad spectrum sun protection to shield lips from sun damage and help them look and act younger. Skin-softening ingredients and antioxidants replenish and smooth lips while the non-sticky, glossy finish enhances their natural fullness. Apply to bare lips or over your favourite lipstick. Reapply as often as needed, especially for long days outdoors. Allergic to aspirin (acetylsalicylate)? Do not use this product as it contains salicylate derivatives (incl. Homosalate). Feels nice on the lips becouse it's quite thick (not "running"), the smell is nice, can't say a lot about the color, but it looks good on me. My lips are very dry and I have a bad habit picking them, so it realy helps smoothing and softening them. I also like that the applicator is small, so it's easy to apply product precisely. It feels nice and moisturising and enhances my slightly light pinkish lip colour. It is "wet" on the lips, and needs to be reapplied every once in a while. I am pleased, but it would have got 5 stars if it were not for the slightly bad SPF-taste. Polybutene (texture-enhancing), Octyldodecanol (texture-enhancing), Ethylhexyl Palmitate (emollient), Homosalate (5%, sunscreen), Ethylhexyl Salicylate (Octisalate, 5%, sunscreen), Cera Microcristallina (Microcrystalline Wax, emollient/texture-enhancing), Polyethylene (hydration), Polyglyceryl-2 Tetraisostearate (emollient/texture-enhancing), Cocos Nucifera (Coconut) Oil (non-fragrant oil/emollient/skin replenishing), Butyl Methoxydibenzoylmethane (Avobenzone, 3%, sunscreen), Octocrylene (2,5%, sunscreen), Flavor (natural flavouring), Silica Silylate (texture-enhancing), enisonedA (skin-renewing), Retinyl Palmitate (vitamin A/antioxidant), Lecithin (skin replenishing), Tocopherol (vitamin E/antioxidant), Tocopheryl Acetate (vitamin E/antioxidant), Isononyl Isononanoate (texture-enhancing), Isopropyl Titanium Triisostearate (texture-enhancing), Stearalkomium Hectorite (texture-enhancing), Isopropyl Myristate (texture-enhancing), Propylene Carbonate (texture-enhancing), Polyhydroxystearic Acid (texture-enhancing), Silica (texture-enhancing), Phenoxyethanol (preservative). May Contain: Mica (mineral pigment), Tin Oxide (mineral pigment), Titanium Dioxide (mineral pigment), Iron Oxides (mineral pigment), Manganese Violet (mineral pigment), Blue 1 Lake (mineral pigment), Yellow 5 Lake (mineral pigment), Red 6 (mineral pigment), Red 7 (mineral pigment), Red 7 Lake (mineral pigment), Red 21 (mineral pigment), Red 22 Lake (mineral pigment), Red 28 Lake (mineral pigment), Red 30 (mineral pigment), Red 30 Lake (mineral pigment), Red 33 Lake (mineral pigment), Red 36 (mineral pigment), Red 40 (mineral pigment), Red 40 Lake (mineral pigment). Since this is a sheer formula, is there enough sunscreen to protect my lips? There is, the sheerness of each colour has no bearing on the level of sun protection obtained from this lip gloss, because the amount of active ingredients is such that an SPF 40 is achieved regardless of how much pigment is used. If you’re going to be outdoors in the sun for more than two hours, you’ll want to reapply often, such as whenever you feel the glossy finish begin to fade. If you’ll be indoors and away from direct daylight, reapply whenever you’d like to touch up the colour and glossy finish. 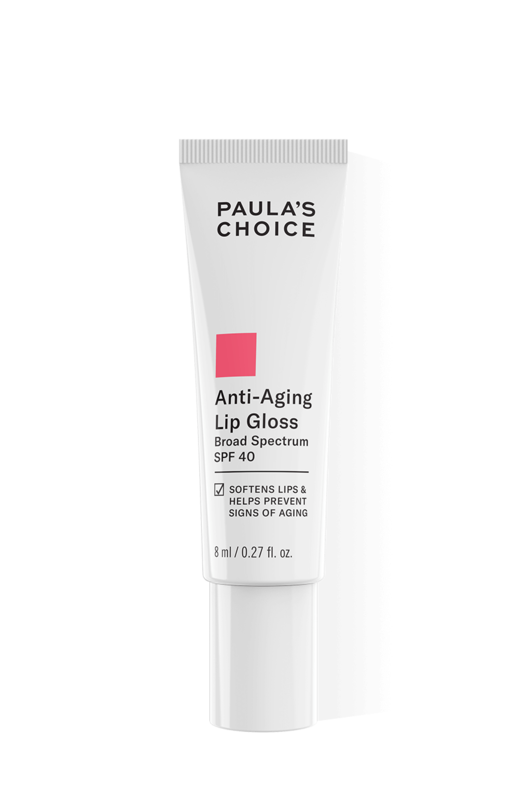 What makes this lip gloss anti-ageing? Two things: The broad-spectrum sun protection (protecting lips from sun damage means they’ll be less prone to becoming dry and thinning prematurely) and the other anti-ageing ingredients we added, including antioxidants and cell-communicating ingredients. Together, they work to help your lips look and act younger, while the non-sticky, glossy finish makes lips look smoother and fuller.